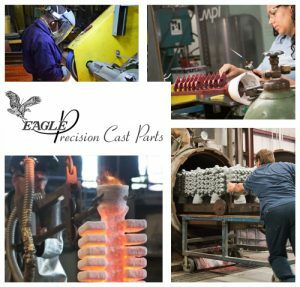 Jobs in Muskegon, MI: Eagle Precision | Eagle Precision Cast Parts, Inc.
Eagle Precision Cast Parts, Inc. has several openings for jobs in Muskegon, MI. If you’re looking for a job in Muskegon, MI, now is your chance to join a growing investment casting foundry offering steady work and great benefits. Eagle precision manufactures over 1,000 part numbers in its 55,000-square-foot facility. Our use of high-tech software and modern product design practices keep us competitive in a changing industry. Beyond manufacturing, we also offer a warm and inclusive company atmosphere. After all, our company is partially owned by its employees through an ESOP program. To apply for a job at Eagle Precision, contact us at (231) 788-3318 or stop by our office at 5112 Evanston Ave.
Work will take place at our investment casting facility at 5112 Evanston Avenue, Muskegon, MI. Curious about what we do at Eagle Precision? Read more on our Services page.